Wow, over 2 years since my last post! A lot of changes have happened in our family over the past 2 years – we bought our first home in a new city, and we started homeschooling! My time and focus have definitely been taken up by these endeavors. But we are still eating great vegan food every day, and I’d love to start sharing some photos and recipes again. Now that summer is upon us, it’s the perfect time to dig back in! The first meal I want to share is this gorgeous South of the Border Pizza, from the Forks over Knives Plan book. I checked this book out from the library last week and as I flipped through the recipes, this one immediately caught my eye! I decided to take a short cut and use whole wheat tortillas to make individual pizzas for every family member, rather than roll out a pizza crust. It turned out just as vibrant and colorful as the photo in the book! Almost all of us ate two of these, minus our 5 year old who just finished one. Next, I’ll tell you about this fantastic hummus recipe, from one of my most well-used cookbooks, The Mediterranean Vegan Kitchen by Donna Klein. It’s a simple, classic hummus, made interesting by the addition of fresh scallions and vegetable broth. It happens to be an oil-free recipe, though there is certainly plenty of healthy fat from the generous proportion of tahini. Even if you have a go-to hummus recipe, this one is worth a try – and there are so many other fabulous recipes in this cookbook, as well! 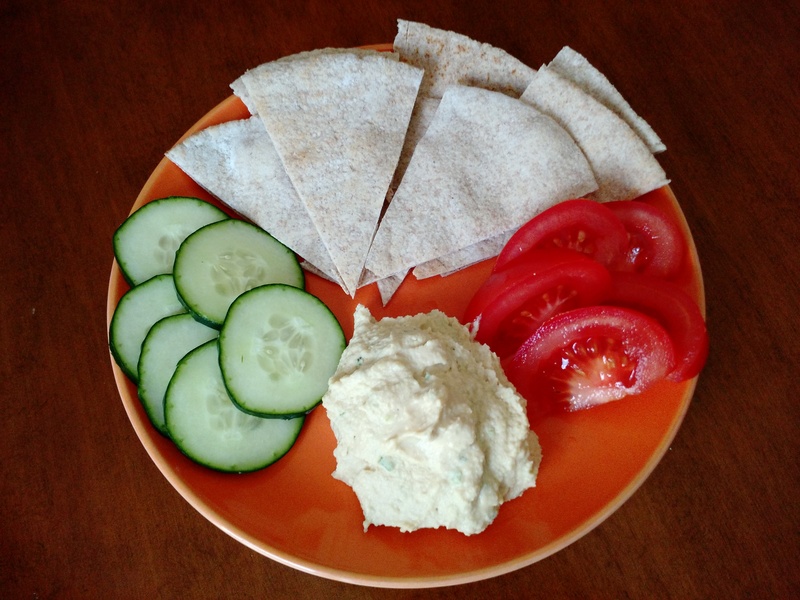 We ate our hummus with whole wheat pita bread, cucumbers, tomatoes, and avocado (not pictured) – delicious. Last, here is a photo I snapped of my oatmeal this morning. Oatmeal is such an economical and healthful breakfast, but it can get boring if you don’t mix it up with some interesting toppings. 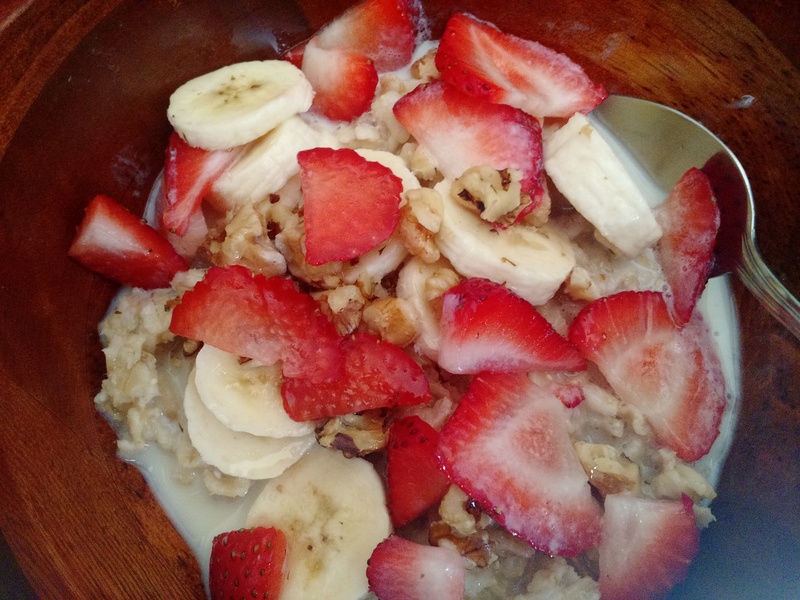 I thought today’s combination was especially pretty: sliced banana and strawberries, chopped walnuts, a drizzle of maple syrup, and a splash of soy milk. We probably eat oatmeal 2 or 3 times per week, and more often in the winter. What is your opinion of oil in a plant-based diet? Do you think we should be getting our healthy fats from nuts, seeds, nut butters, avocado, and whole olives? What role should foods like olive oil, earth balance spread, and vegenaise play, if any?